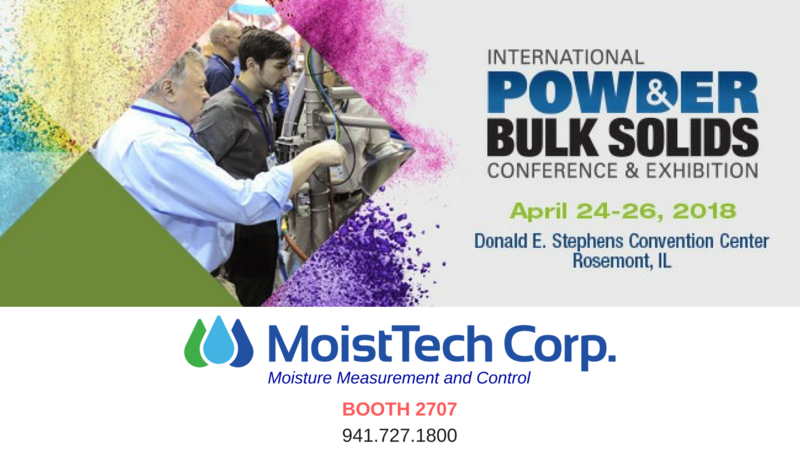 International Powder & Bulk Solids Conference & Exhibition — iPBS 2018— is the leading event for professionals in powder and bulk solids technology in the Western Hemisphere. Since 1976, The Powder Show has brought the world’s processing and bulk material handling community together to share ideas, deepen industry knowledge and explore the equipment and technologies that drive the industry. This April, The Powder Show will once again connect over 3,500 industry professionals and more than 350 leading suppliers for three days of unmatched industry immersion and innovative equipment. Join MoistTech Corp. for iPBS 2018 in BOOTH 2707 for live demonstrations of our Near-Infrared Technology and how we can help you improve your manufacturing process. What’s worse than a wasted effort? Economical losses and decreased productivity. 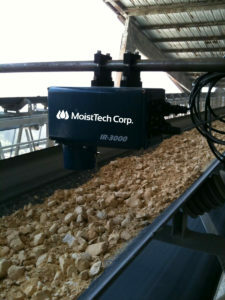 Ensure you have a proper Moisture Measurement and Control system in place with MoistTech! The IR3000 operates reliably and where other sensors cannot. Whether you work with fine gain to large aggregates in very dry or saturated conditions, the IR3000 is easy to integrate into process lines, conveyors, bins and/or silos. The intelligent pre-processing of the measurement values (300+ per second) allows for smooth average values, adjustable filters, and up to 50 standard calibration curves, stored in the sensor. Three self-powered analog outputs 4-20mA, allow for the easy connection to control system and a very advanced PC software is included at no charge with connections via Ethernet or RS232/485. The IR-3000 takes instant, non-contact measurements of moisture in % dry and % wet measurements, and regulates moisture content either automatically or manually to suit your needs. It’s also capable of measuring temperature and other important constituents. In some cases, measuring and controlling moisture can reduce transportation costs due to shipping excess water. Additionally, moisture control stops products from freezing during shipping and transportation.Testing moisture content throughout the process also provides mineral manufacturers cost savings in energy & fuel costs, as well as having less product waste. With continuous NIR online moisture testing, manufacturers can monitor moisture levels which they in-turn, can precisely control their dryers to optimize the production process with minimum energy requirements. Contact us today to discuss the specifics of your application.